Why fear the deer when you have ice in your veins? And the calf of Giannis Antetokounmpo isn’t running that night either. Confetti fell piece by piece on the Fiserv Forum floor last night. Not in a celebration shower, but dribs and drabs like the way it kept stutter stopping the rate of play last night like playing golf behind Charles Barkley. It sure made for a great way to Rajon Rondo put someone off their free throw technique as players would go to the line and play clean up like it was all in good nature. Commentators thought the ticker tape was to coronate the Milwaukee Bucks 60th win of their beast, best in the East NBA season this Saturday. But it was actually a still standing and floating souvenir from last week’s epic gig by British band Mumford and Sons, touring their latest definitive ‘Delta’ album for this arenas first sellout. And even if it was the former like Forum balloons floating down to a Lakers Game 7 floor as the Celtics walked off it champions, D’Angelo Russell’s ice box made sure that party was over before it even got started like parents coming home early. He’s elimination familiar to turning what should have been a celebration at home to a heartbreak hitting the road. Ain’t that right Lake Show? That’s all too familiar hey? Lo made sure confetti would not rain or reign tonight. Unless it was to fall on an empty floor of home losers who couldn’t protect this house. There would be no sweet 60th win tonight. Last night there was more chance of a fiftysomething celebrating hitting sixty. But then again with most 50 year olds these days looking like Keanu Reeves or Paul Rudd last night (Happy Birthday Ant-Man. If only Scott Lang’s birth certificate wasn’t so small) you’d have an easier time convincing me that these dudes were middle-aged than believing that these Brooklyn Nets weren’t going to make the playoffs this campaign. Even if in the Eastern Conference standings right now there’s more spots open than Clearasil, with everyone pouring everything they’ve got into this last half week with the West already set. 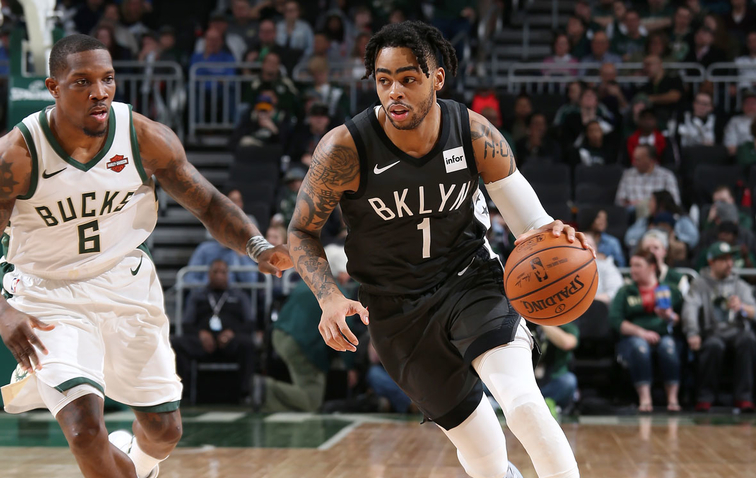 Despite the Bledsoe show without the Greek Freak notching a Lew Alcindor 33 to go with the rest of the 100, D-Lo had 25 points and 18 in the first half, to go along with a double trouble of 10 rebounds as he cut the nets in Wisconsin. Bucking the Bucks 133-128. But this ice tray was a finger to pulsing vein attack that was perfectly balanced like Thanos dagger, or like everything should be. The B.K.N. are in the endgame now. But they’ve got the avenging heroes before their season turns to dust, like a former Showtime star that Magic mad titan Thanos-ed away with a snap of the fingers like he almost did half of his team this year. Turns out this kids a real Marvel captain. Turns out he’s more than a leader. The SLAM cover crowned B.I.G. new King of the real New York is a team player too. For the people. Imagine that. If he ruled the world. Nasty like Nas with that pure shot. He is the one. And they’ve built a five around him in the borough of Brooklyn. A seven zip run to end the fourth and the final score of this game with the Bucks not cashing anything in for two and a half minutes was capped by a three pointer from this year’s All Star contest winner in Charlotte, Joe Harris (to go along with 14 and 6, LeVert’s 24 and Chris Dudley’s sweet 16) as these Nets moved to 40-40 like former owner Jay-Z’s nightclub and a perfect .500. Soon the confetti won’t have to wait to fall through the nets of a no sleep in Brooklyn celebration. No sleep to the playoffs. Brooklyn is most definitely in the house. If life really is measured on f###s. L.A. guard of the Clippers kennel, Patrick Beverley has none left to give. Frankly my dear, in Hollywood this guy doesn’t give a damn. He doesn’t care that the Lakers drafted and dealt him like Pau Gasol’s younger brother Marc (even if for fuel he once may have). They’ve made that young core mistake time (Julius) after time (D’Angelo) and history will Anthony Davis itself again. He doesn’t care about LeBron James and his Hollywood throne. Or even Lonzo Ball and his opening night. He doesn’t care that the Lakers are the Tinseltown toast of Hollywood and L.A.’s team. He doesn’t care that they share STAPLES like borrowing office supplies from the next cubicle. They aren’t even in the playoffs right now. But his team is. Covering up banners with the balls to raise one of their own one day. He cares about this side of L.A. Their way. Patrick Beverley doesn’t care about the Houston Rockets, James Harden, Russell Westbrook, or the Oklahoma City Thunder like Kevin Durant. And he doesn’t care about him or Steph Curry, Klay Thompson, Draymond Green, DeMarcus Cousins or any Splash Brother Warriors from Oakland to San Francisco. You can talk about how Kevin Durant cares about him though. Look at that look of love for the game he’s bringing on his face in the midst of all that trash talking respect disguised as hate. I haven’t seen Kevin this happy in years. For all that emotion K.D. has received ever since he switched shores to the Bay, this is the only time he’s loved this type of hate. Because it’s not that. It’s just the passion of competition. And there’s nothing “just” about that, although all is fair in love and basketball war. Because like the late, great Charlie Murphy once said about Prince serving pancakes and behind the backs on ‘Chappelle’s Show’ epic real Hollywood stories, “this cat can ball man”. Would anyone like some grapes? I guarantee Patrick Beverley doesn’t care if you do. 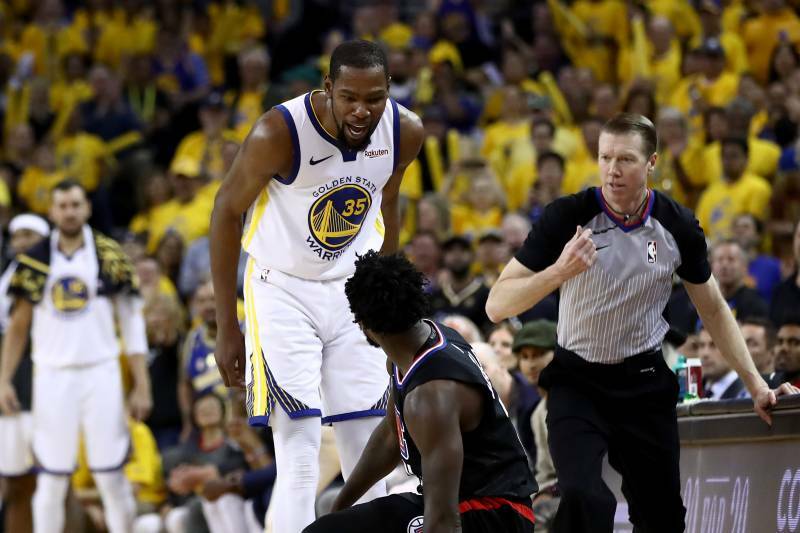 Like he doesn’t even care that Durant dominates this photo that speaks a thousand words or more for this article like we were shamelessly trying to bait more clicks. When really we’re trying to show how David looks in the face of Goliath from his vantage point. Not to mention the joy laced with “oh s### this guy’s really got me” look on the face of one of the greatest in the game about to get ejected too for going toe to toe with a super sub. But never underesimate the power of a microwave player like leaving your reheated Subway sandwich in the nuke cooker for too long. No matter how much you blow on it or fan it with you skittish hands, it’ll never quite feel like it’s going to cool off from its magma serving like a deep burn (we’re talking more ‘Big Bang’ Sheldon Cooper Aloe Vera here, more than ‘Anchorman’ Ron Burgundy’s thousand bicep curls that probably started at around nine hundred and ninety nine). Hello Lou Will, 6 Man of all-time, popping nachos after he did the Warriors celebration balloon like fallen Forum ones in Celtics cursed storied Lakerland. He doesn’t care about tacos, this cheese is for all the salsa. Pat Bev doesn’t even care that this Laker fan wishes he would have worn purple and gold like others he still wishes would (miss Zu). Like he probably doesn’t care for this shortened version of his name. Patrick Beverley won’t even care about this article but we do. He doesn’t care that the Durant dynasty as hot as Curry from downtown Oak Town are champions for years running more than faucets that leak as much as the splash in the Golden Gate of Golden State’s Pacific. To be specific he doesn’t even care if his team is down 31. Because another 30 points from sweet Lou will turn this game around and into the makings of a all guts to their own glory road, ESPN 30 for 30 documentary as the Clippers clip all that like short back and sides. Just like the place you parlour pool your postgame analysis in the next day as you’re former haircut gets dustpan swept up like many people thought these L.A. kings of the underground would be on their way by now like “we close in half an hour”. But now they stand as underdogs of the year in an end of season award category that should be invented with this guy being it’s de facto MVP for his team. Most Improved? Nah? Patrick Beverley doesn’t care about that. He doesn’t care about you. The name on the back of your jersey. Or the team on the front. No matter how many people in the stands share those strands. He doesn’t care if he gets in your head like the Spotify song of the moment, or under your skin like that underrated Scarlett Johansson movie that sees her as an alien riding around Scotland in a a truck picking up dudes (why was I not in Glasgow that week?). He doesn’t care that I wasn’t in Glasgow that week. Neither does Scarlett. What he does care about is his job, his role and his team. And he doesn’t care if he has to get ejected like the passenger seat in James Bond’s old Sean Connery era Aston Martin to do it. He doesn’t care if you’ve just been jettisoned from 007’s car. He doesn’t care if you’re shaken or stirred. You should have worn a seatbelt. He cares about buckling up and down. Guarding the opposing teams best player. Even if it is one of the best in the world right now. And he doesn’t care about switching to the other best player in the world on the same damn team if the occasion calls for it. He doesn’t care about that. He just cares about rising to the occasion. Answering the call. He doesn’t care if Philly are on their phones. He cares about what’s at stake. He cares about making them sweat for every shot, swat or not. He cares that tonight’s he’s going to give his all come tip. Because here’s a tip for you, what Patrick Beverley DOES care about is the game. Like the one Allen Iverson goes out there and dies for. Forget practice. Stepping over Kevin freaking Durant like Ty Lue. Like he 1 through 15 cares about his band of brothers. Like family. Like what he’d give everything for. Sweat after shot. Cheap or invested. Never throwing in the towel, or even taking a Gatorade break. Unlike Young Jeezy he doesn’t even care about how much Gatorade makes. And who even cares about Lob City these days after they threw it all away? Chris Paul, Blake Griffin and even saving Jordan before DeAndre ended up at the Garden like M.J. at his best? That’s all history Doc. He cares about Rivers that run deep. Not the air up there in LAX like the Hollywood Hills, but the grounding reality of what this game is all about. Spalding to hardwood. Patrick Beverley doesn’t care about 10 points and 5 assists. His line or a career high. All he cares about tonight is that the box score of stats reads a W for the team he gives his blood, sweat and opponents tears for. So here’s for him, whether he cares for it or not. Like being the only player that reminds us of those golden era mined tough 90’s years. Or much like those Oakley and Mase (Rest Peacefully money) Knicks, in stark contrast the grit and grind Grizzlies that this gnarly son of an expletive-we can’t mention like the no f words given again and again in this article-would be perfect for alongside fellow defensive dog back in the day Tony Allen. He doesn’t care that there’s no one like him in a league who needs more players exactly like this. Because believe me you know who does care? Every other player in this league who has to face him. Because face it. Like him or not he’s the realest thing to happen to this game since hand checking. So you really do have to hand it to him. But if you don’t? Guess what we don’t give? When your name is Lou Williams nothing is out of reach. Exhibit A — casually rescue your team from a 31-point hole to set an NBA playoff and Los Angeles Clippers franchise record for the largest comeback victory — defeating the defending champs Golden State Warriors 135-131 in one of the few remaining games in a building where post-season victories rarely comeby. Exhibit B — Continuing the 36-point, 11-assist double-double by double-dipping on a large nacho-platter in the Warriors visiting room whilst cooling out the knees to funny social media memes of historic events that just transpired. Exhibit C — casually show-up in eating nachos on infamous masterpiece paintings such as Leonardo Da Vinci’s “The Last Supper” or casually Sunday afternoon chilling on George Seurat’s oil on canvas island of La Grand Jatte from 1884.